Soldiers are saddened to learn of the passing of the 2nd Sergeant Major of the Army SMA (Ret.) George W. Dunaway who served as SMA between September 1968 to September 1970. Born July 24, 1922, in Richmond, VA, SMA Dunaway enlisted in the Virginia Army National Guard’s 29th Division in January 1940 and was mobilized with the Division in February 1941. In 1943 he volunteered for parachute training, then later Pathfinder and glider instruction. He spent the majority of his career in Airborne Infantry assignments, serving with the 501st Airborne Battalion; the 187th, 505th, 517th and 542d Parachute Infantry Regiments, along with service in the 82d and 101st Airborne Divisions and the Special Forces. Dunaway served in France in World War II with the 517th RCT and fought in Germany and Belgium where he participated in the Battle of the Bulge, the first of his three combat tours. He left Europe and went to Ft Benning where he reenlisted and eventually was assigned to Ft Bragg with the 505th Parachute Infantry Regiment (PIR). In September 1950 he and select members of his battalion were sent to Nevada to participate in nuclear testing and their effects as part of an exercise called “Tower Blast.” He would go on to serve as the Regimental Sergeant Major of the 505th PIR in 1952. 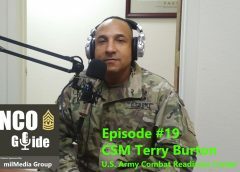 He continued to serve in assignments of increasing responsibility with the 505th and was reassigned to the 187th RCT in Japan until it redeployed to Ft Bragg, and then to Ft Campbell. He served with the “Rakkasans” continuously until 1961, when he was assigned to the 1st Special Forces Group in Okinawa. It was there he introduced one of his trademarks, the Special Forces blazer. He went on to serve as the Sergeant Major for the 5th Special Forces Group in Vietnam. In June 1967 he was assigned as the Division Sergeant Major for the 101st Airborne Division at Fort Campbell and accompanied them back to Vietnam. It was from there he was selected as the second Sergeant Major of the Army. Dunaway was the second and last Sergeant Major of the Army to be selected personally by the Chief of Staff of the Army as subsequent SMAs were selected by a special board of officers and the incumbent. During his two-year tenure, Dunaway affected many policies and an Army during an unpopular time. Some of his personal achievements included his ability to influence the policy for wear of the Pathfinder special skill badge simultaneously with airborne wings. It was also during his tenure that the Army implemented the newly developed Noncommissioned Officer Education System, and he furthered the implementation of the Sergeants Major Academy. SMA Dunaway was able to impact on policies relating to the Command Sergeants Major program during his term, along with standardizing titles between Sergeants Major and Command Sergeants Major. 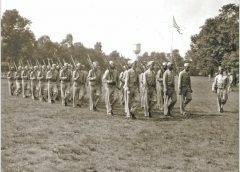 Additionally, he was instrumental in correcting what he believed a longstanding problem—the lack of additional pay for drill instructors, an incentive he believed was instrumental in attracting and retaining good soldiers to the program. Though the term of the Sergeant Major of the Army is to coincide with the tenure of the Chief of Staff, Dunaway recommended it be limited to the two years both he and his predecessor would serve. He not only believed it allowed other equally deserving Command Sergeants Major the opportunity to serve in that position but that it would allow senior enlisted soldiers with recent experience with troops to provide a fresh flow of ideas to the Chief of Staff. Sergeant Major of the Army. George W. Dunaway retired on September 30, 1970, after 30 years of faithful service as a soldier. He continued to support the Army in retirement, and as recently as January 8, 2008, participated in the Sergeants Major of the Army conference in Fort Bliss, Texas. He remarked during an interview later in life that “I am not only proud of having been Sergeant Major of the Army, I am proud to have been a soldier. When you think of the freedom you enjoy in this country, think of the sacrifices the soldier has made to keep us free.” Sadly he passed away on February 6, 2008, in Las Vegas, Nevada. Distinguished Service Medal, Silver Star, Legion of Merit, the Bronze Star Medal (with “V” Device), Purple Heart, Air Medal (with “V” Device), Army Commendation Medal (with Oak Leaf Cluster), Good Conduct Medal, American Defense Service Medal, American Campaign Medal, European-African-Middle Eastern Campaign Medal, World War II Victory Medal, National Defense Service Medal, Vietnam Service Medal, Vietnamese Armed Forces Honor Medal, Second Class, the Vietnamese Cross of Gallantry (with Silver Star), Republic of Vietnam Campaign Medal, Master Parachutist Badge, the Pathfinder Badge, and the Combat Infantryman Badge with Star. “New Voice at the Top for the Enlisted Man.” ARMY (November 1968): 47-48. “Let’s PULL Together: Professionalism- Unity- Leadership- Loyalty: A Winning Combination.” Army Digest (June 1969): 27-28. “New Emphasis Aims at Putting More Strength in ‘Backbone of the Army. '” ARMY (October 1969): 33-36. “‘People Benefits’ Will Get More Emphasis in the ’70s.” ARMY (October 1970): 33-35. “Turning 227: Army birthday celebrated” Las Vegas Review-Journal, (June 15, 2002). “NOTED VETERAN: ‘Soldier’s soldier,’ 85, dies,” Las Vegas Review-Journal, (Feb 7, 2008). 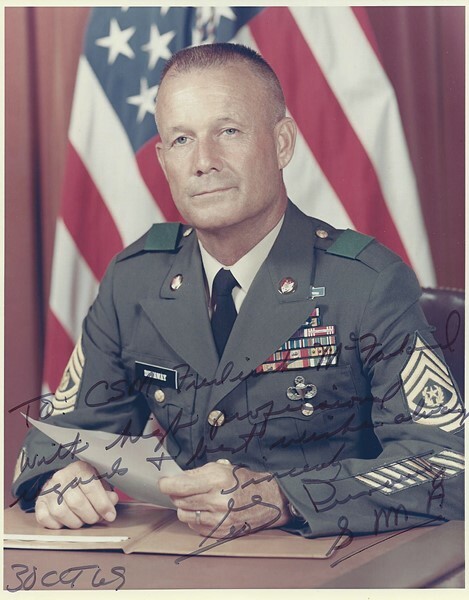 “A professional…is a dynamic, growing being who has learned from the past, acts in the present, but above all, focuses on accomplishing his mission.” -SMA George W. Dunaway, “Let’s PULL Together: Professionalism- Unity- Leadership- Loyalty: A Winning Combination.” Army Digest, Jun 1969, p. 28. “The equipment and weaponry will continually change and improve, and the size of the military will expand as needed, decreasing during times of peace. But the unyielding will of the soldier and the dedication of professional military leaders will not change. -SMA George W. Dunaway, Center of Military History Interview, 1990, p. 66. “You must give [soldiers] reasons to have confidence and pride in themselves, in their leaders, and in their units. Only then will you have loyalty.” -SMA George W. Dunaway, Center of Military History Interview, 1990, p. 60. “The American soldier…is unbeatable in war…. We cannot give the American soldier too much credit…. He deserves everything we can do for him and he deserves all the respect we can show him…. Whether or not a war is popular among the nation’s people, and whether or not it is supported by the legislators, has no bearing on what the soldiers do and think. They perform their duties magnificently and bravely. They don’t make the policies, and they don’t declare war. But they fight, they bleed, and they die. And they do it unhesitatingly. They should be appreciated and recognized for it, without regard for the political aspects of the war.” -SMA George W. Dunaway, Center of Military History Interview, 1990, pp. 41, 65.